Democratic Rep. Maxine Waters of California appears a lock to become the next chairman of the House's powerful Financial Services Committee. 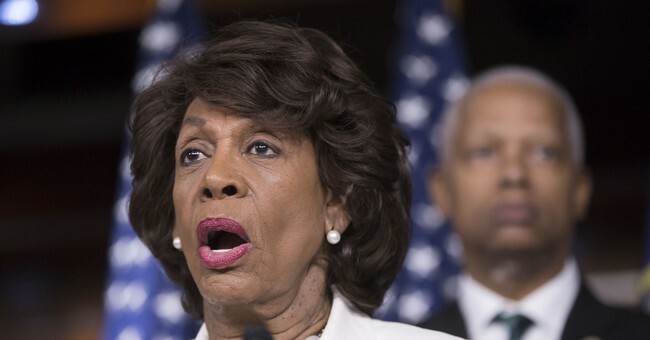 Waters is pledging to be a diligent watchdog for mom and pop investors, and recently told a crowd that when it comes to the big banks, investment houses and insurance companies, "We are going to do to them what they did to us." I'm not going to cry too many tears for Wall Street since they poured money behind the Democrats in these midterm elections. You get what you pay for. But here we go again asking the fox to guard the henhouse. Back during he the financial crisis of 2008 to 2009, which wiped out trillions of dollars of the wealth and retirement savings of middle-class families, we put the two major arsonists in charge of putting out the fire. Former Democratic Sen. Chris Dodd of Connecticut and former Democratic Rep. Barney Frank of Massachusetts were the co-sponsors of the infamous Dodd-Frank regulations. Readers will recall that good old Barney resisted every attempt to reign in Fannie Mae and Freddie Mac and said he wanted to "roll the dice" on the housing market. That worked out well. Meanwhile, Dodd took graft payments in the form of low-interest loans from Countrywide, while greasing the skids for the housing lenders in these years. Instead of going to jail or at least being dishonorably discharged from Congress, he wrote the Dodd-Frank bill to regulate the banks. Enter Maxine Waters. Back in 2009, I had a run-in with "Mad Maxine," as she is called on Capitol Hill. The two of us appeared together on HBO's "Real Time With Bill Maher," and when she pontificated about the misdeeds of the housing lobby, I confronted her on the money she took from Fannie Mae and Freddie Mac PACs for her campaign. MAHER: Don't you think Wall Street needs regulation? That's where the problem is: that there was no regulation. MOORE: Well, let's talk about regulation. One of the biggest institutions that have failed this year was Fannie Mae and Freddie Mac. This is an institution that your friends, the Democrats, in fact, you, Congresswoman Waters, did not want to regulate. You said it wasn't broke five years ago at a congressional hearing, and you took $15,000 of campaign contributions from Fannie and Freddie. MOORE: Yeah, you did. It's in the FEC (Federal Election Commission) records. MOORE: And so did Barney Frank. And so did Chris Dodd. WATERS: That is a lie, and I challenge you to find $15,000 that I took from Fannie PAC. I have to confess that Waters is very persuasive. I feared when the show was over that I had gotten my numbers wrong and that I had falsely charged the congresswoman of corruption. But several fact-checking groups looked it up, and sure enough, I was right. She took $15,000 from the PAC and another $17,000, all told. "Through nearly a dozen hearings, we were frankly trying to fix something (Fannie and Freddie) that wasn't broke. Chairman, we do not have a crisis at Freddie Mac, and particularly at Fannie Mae, under the outstanding leadership of Franklin Raines." We learned the hard way just four years later; this was all a fraudulent claim to avoid oversight of her campaign contributors. Imagine if a Republican had said these things. She took in more than $100,000 from Wall Street this year as well. None of this is illegal, but it calls into question her shakedown tactics. First, she threatens to put their head in a noose as chairman of the Financial Services Committee -- as she is getting them to pony up campaign contributions. Pay to play? You decide. Waters has had run-ins with the House Ethics Committee because of fundraising tactics and insider wheeling and dealing. Back during the financial crisis, she was suspected of helping arrange meetings with Treasury Department officials and getting bailout money for OneUnited, a troubled bank that her family owned major stock holdings in. She beat the rap of corruption, but it sure smelled bad. So will Maxine Waters be the crusading financial protector of our 401k plans and save America from the next financial bubble? Well, there will certainly be lots of harassment and shakedowns. But don't count on her steering us clear of Wall Street excesses. If history is any guide, Mad Maxine will be way too busy raising money from the people she is now in charge of regulating.